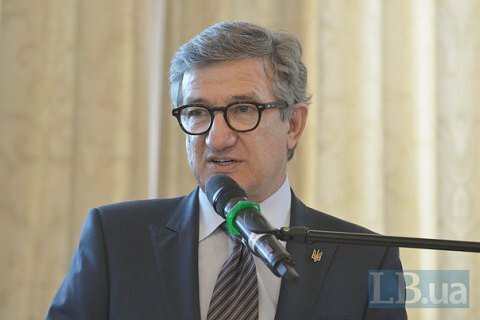 The NBU is outraged and demands a criminal case against Taruta. MP Serhiy Taruta at the annual meeting of the IMF on 6-10 October in Washington, DC distributed a brochure about the governor of the National Bank of Ukraine Valeriya Hontareva. The pamphlet titled A threat to Economic Security of Ukraine was prepared by the Association of Ukrainian Banks, headed by Oleksandr Suhonyako. "The brochure distributed personally by Serhiy Taruta, is a bunch of false, offensive and distorted information and accusations of an official of corrupt activities, the alleged collapse of the nation's banking system and the creation of risks to the economic security of Ukraine. Some of that information has been spread in recent years on the websites of dubious Internet publications and was repeatedly refuted by both the National Bank and the National Anti-Corruption Bureau of Ukraine," the press-service of the central bank said in a statement Friday, 14 October. The NBU believes that such actions contain signs of interference with the activities of a statesman and high treason. "Some of our oligarchs, unfortunately, still do not care about the development and prosperity of Ukraine. They are concerned about their own greedy interests, hampered by the National Bank, that closed some "vacuum-cleaner banks" through which they for decades have credited own business and syphoned billions of hryvnia out of the country's economy. Instead of a constructive dialogue with foreign partners and friends of Ukraine, they embark on the path of dirty insinuations and provocations, do not hesitate to disseminate false materials even at a meeting of the IMF," Hontareva commented on the incident in Washington. The central bank believes that Serhiy Taruta must not go unpunished and calls on the Security Service, the PGO and NABU to probe in the case.